My eleventh ground of 2016 was on Tuesday 9th August at Falmer Stadium in Falmer, East Sussex. 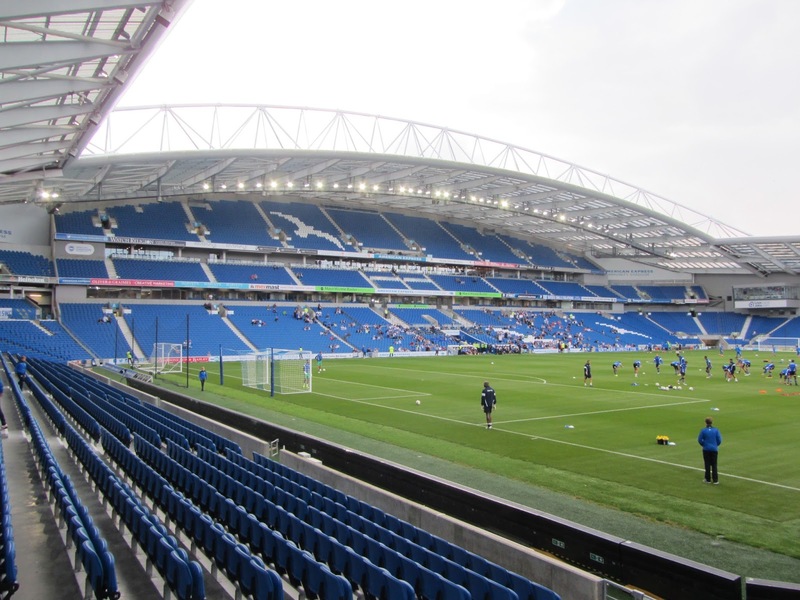 The match was Brighton & Hove Albion vs. Colchester United in the Football League Cup 1st Round. 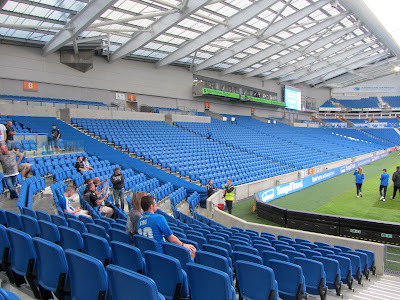 Falmer Stadium, currently known as the American Express Community Stadium or the Amex, lies in the midst of two university campuses - the University of Brighton and the University of Sussex. To the north-east of Brighton the ground is located just off the A27 and is served by Falmer railway station which is adjacent to the site. The venue was opened in 2011 giving the club a permanent home for the first time since leaving the Goldstone Ground in 1997. The stadium's unusual shape, designed to fit in with the surrounding rolling hills, sees to large stands running alongside the pitch and short ends behind the two goals. 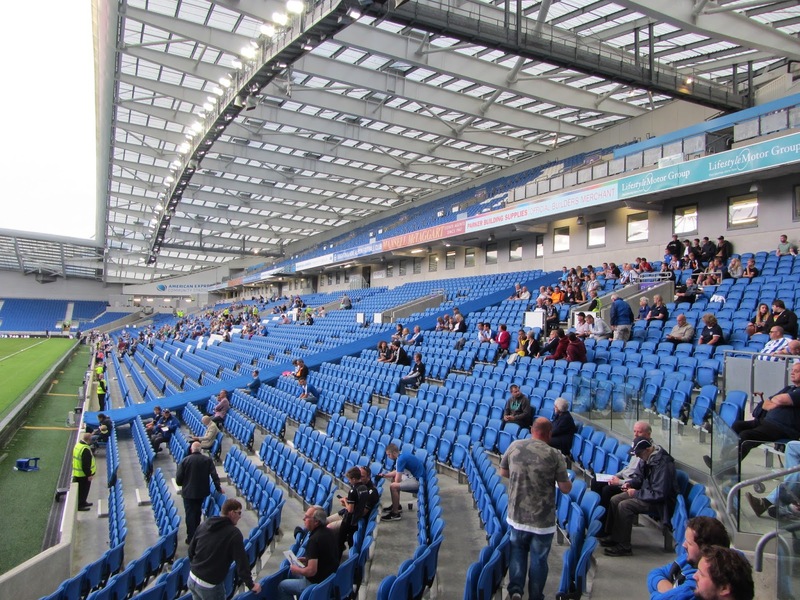 When the venue opened in 2011 there were four separate seating areas but within six months the club applied to add an additional 8,000 seats taking the overall capacity to 30,750 by the end of the 2012/13 season. The result of this is that all four quadrants have been filled in creating a lower tier bowl throughout the ground. With the short ends behind the goals the North and South Stand are single tier. The South Stand has a small hospitality area with a balcony overhanging the seating while the North Stand has a control centre and offices contained within. On the exterior of the North Stand there is the large club shop and ticket offices. The largest stand in the ground is the West Stand which has three tiers. The middle tier is thinner than the other two and also extends out into the north-west and south-west quadrants. There are corporate boxes placed at the top of the lower and middle tiers and the fans 1901 Club is also included. As the largest stand a number of offices and meeting rooms are housed within. Opposite this is the East Stand which was a single tier stand when Falmer Stadium opened but a second tier was soon added. The south-east corner is where away fans are positioned with the hill directly behind this corner of the ground being the designated area for coach parking. 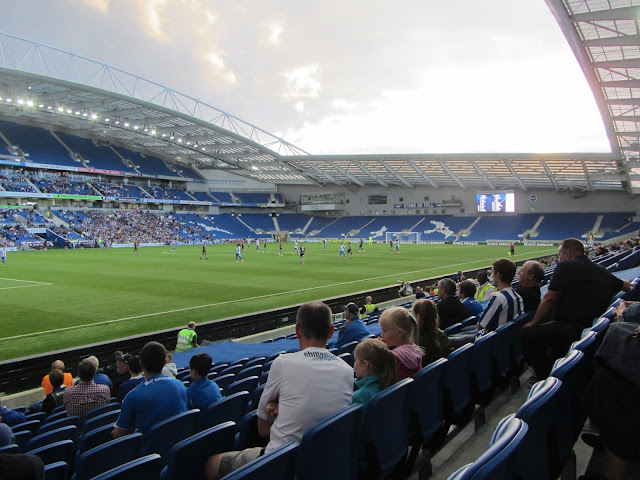 This was a League Cup 1st Round tie between Football League Championship side Brighton & Hove Albion and Football League Two side Colchester United. The first half was a cagey affair - Colchester had come with a tightly packed defence and frustrated the home side to a handful of half chances. The visitors had a couple of counter attacking moments with Sammie Szmodics going closest with a header from six yards. Colchester's resistance was broken in the 64th minute when Kazenga Lua Lua went down the left wing and squared for Sam Baldock on the edge of the area. Baldock had time to readjust and curl an effort into the top of the net. Once the first goal went in that was the end of the challenge from the visiting side as the hosts added two more in quick succession. The second goal was scored in the 70th minute when Lua Lua again ran at the U's defence before slipping in Jamie Murphy who ghosted behind the back line and chipped the ball over Dillon Barnes. In the 74th minute Colchester were undone down the left wing again as Baldock had time to pick out Elvis Manu in the area with Manu sliding low into the goal. The Championship team rounded off the night with a fourth in the 86th minute as Jamie Murphy ran through three defenders on his way to steering the ball into the bottom corner. 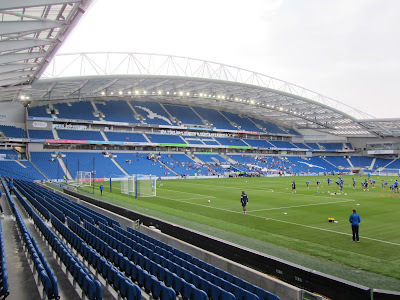 Though the League Two side had put up a decent performance for the first hour the capitulation in the final third saw Brighton record a comfortable 4-0 victory.